As a service to our students and alumni, we provide information on part-time and full-time job opportunities. 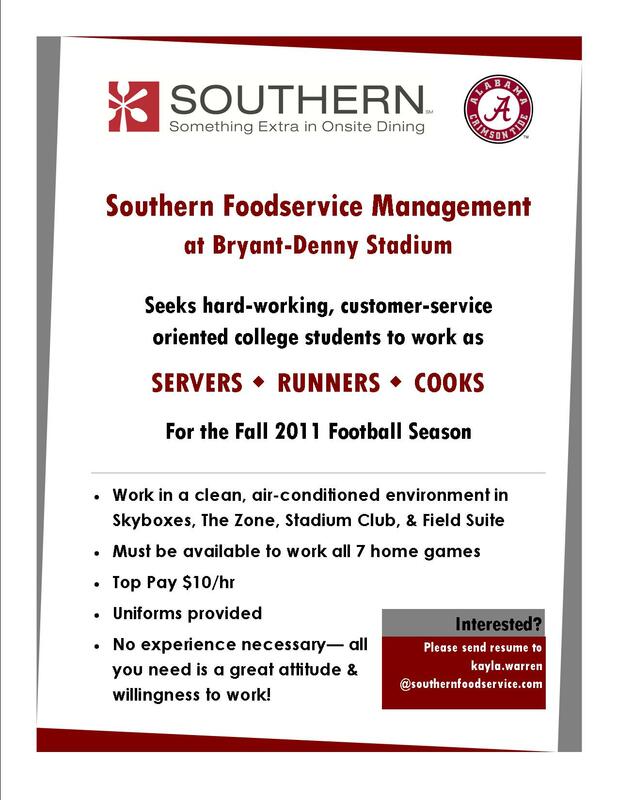 Bama Dining is looking for baristas that are outgoing, work well with others and are self-starters. Work at a fun job on campus with flexible hours. If interested apply in person at the Starbucks in the Ferguson Center. Please visit our website www.pchresorts.com to apply for this position. Best Western Park Plaza Tuscaloosa is currently searching for Guest Services Representatives. Applicants must be able to work flexible hours, weekends and some night audit. Uniforms supplied by the hotel. The property is currently undergoing a complete renovation. Come be a part of our great team! Best Western: The World’s Largest Hotel Family. Hilton Garden Inn Tuscaloosa is currently looking for an Assistant General Manager and a Front Desk Agent. For more information contact Gee Rios. Full time management position in the tennis pro shop. Assistant Front Desk Manager – Full Time – 24K salary. Sales Coordinator (will be reporting direct to ME) – $12.00/hr., but will average $24,000.00 – $25,000.00 per year. Houskeeping Supervisor (great way to learn “the back of the house”) – $9.50 – $10.50 per hour. Engineering Supervisor (they would need basic repair skills) – $11.00 per hour. Grand Hyatt DFW Job Announcement. Hyatt’s application process is completed via internet. Please refer to the on-line application instructions to apply. Local Catering Manager at Gaylor Hotels (Nashville, TN). Apply at www.gaylordcareers.com.